Critical thinkers, unite! Element combined with Carolina Day School (CDS) in a dynamic way back in 2011. CDS is a proud independent school local to Asheville, North Carolina, and was seeking an advertising partner with many different capabilities within a unified platform for communication. Their broad goals were to increase applications and enrollment, and ensure that their brand was pointed in the right direction. Through heavy research with parents, students, and alumni, we drew an accurate and nuanced picture of who we were speaking to first, and began a process that sought to differentiate the school from its many local competitors. It was clear the school had great stories to tell, but was merely trying to emulate its competitors instead of seeking to differentiate from them, leading to target confusion about who CDS was and what made them exceptional. By tracing the decision makers within households back to mothers, primarily ones who were often well educated themselves, we embarked on a campaign that made great use of web banners, print, digital outdoor, and public radio sponsorship. Thanks to heavy research, we gleaned that the Upper School (what most of us know as high school) had a small break from the typical target profile. Element realized the school needed to speak to the teens who loom largest in terms of making the decision on which school to attend. Also realizing that we didn’t speak the teen vernacular, we created a class we taught within the school. One of the byproducts of this class was a Facebook presence created by the students themselves, with content curated by them and them alone, pointed at other teens. In this way, we were assured the language was right and the medium was appropriate to the target. In its first year of engagement, Element lifted the school’s applications 19%*. Admissions inquiries in CDS’ Lower School, Middle School, and Upper School combined are up 88% from last year at this time. 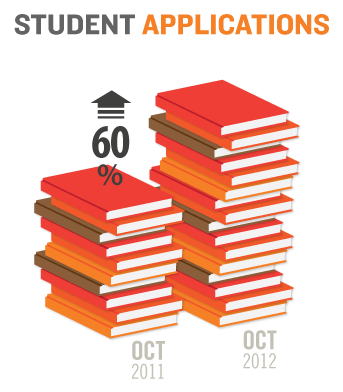 Applications are up 60% from October 2011. 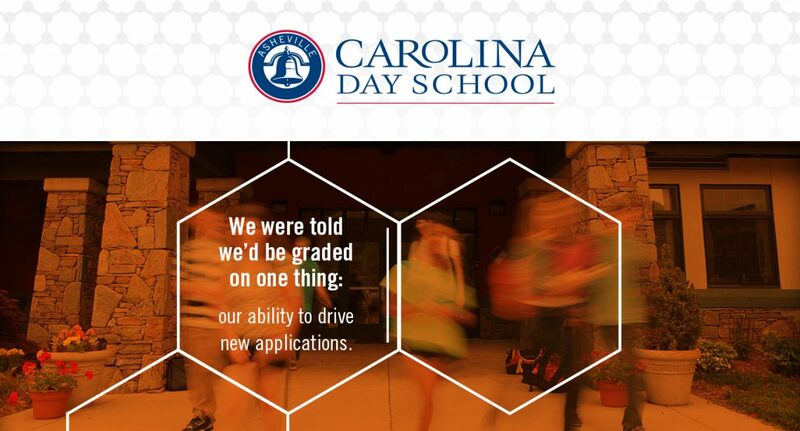 Applications to Carolina Day School are up 53% from this week last year. Admissions inquiries for this time in November are up 46% overall from last year to this year. As compared with May 2012, CDS is seeing higher inquiry numbers and earlier engagement in the admissions process: applications are up 20% and new enrollment is up 13%. As mentioned, our engagement with Carolina Day School used “inquiries, applications and enrollment” as the metrics by which our performance would be judged. 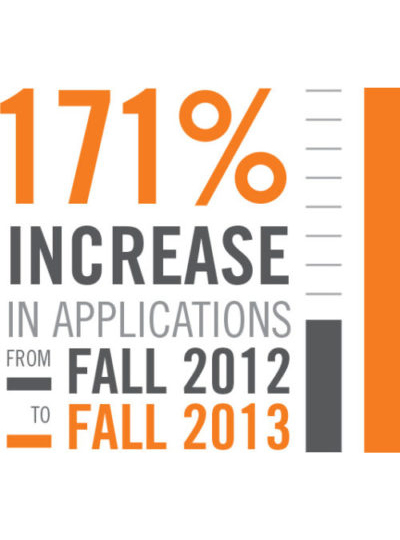 We’re happy to say that we saved the best for last: a 171% jump in applications from fall 2012 to fall 2013.